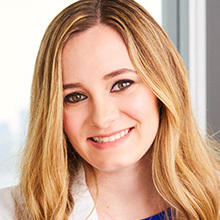 Lexie Sachs is a Senior Textiles Analyst at the Good Housekeeping Institute. Her work includes evaluating and reporting on consumer products for editorial consideration as well as the Good Housekeeping Seal and Green Good Housekeeping Seal programs. She sits on textile-testing committees to develop industry standards and is often consulted as a textile expert by other media outlets for shopping recommendations and care tips. Lexie’s background includes product development and merchandising in both the fashion and home industries. She has a BS in Fiber Science from Cornell University.